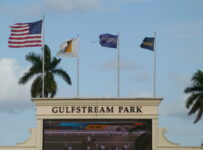 Gulfstream Park has a nine-race card on Thursday, with first post at 1:15 p.m.
A turf optional claimer for 3-year-old fillies and carryovers on the rolling Super Hi-5 and on the Rainbow 6 are the main attractions. 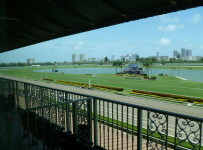 The dirt track is listed as fast and the turf is listed as firm. 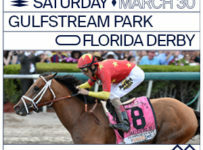 Six races are scheduled for turf. 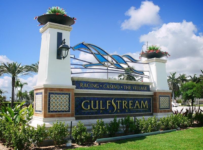 According to the Weather Channel, there is a 40 percent chance of thunderstorms around 2 p.m. but otherwise a 15 percent chance of rain during racing hours in Hallandale Beach where Gulfstream is located. 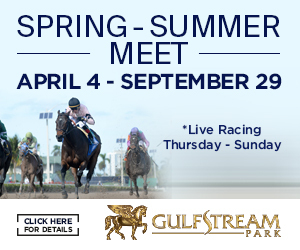 The seventh race is a $50,000 optional claimer at 1 1/16 miles on turf for 3-year-old fillies. The purse is $34,000, and scheduled post is 4:26 p.m. 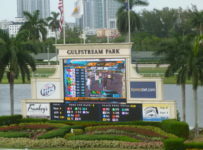 The race has several recent maiden winners that could have potential as stakes runners. We will have a preview early this afternoon on our blog. 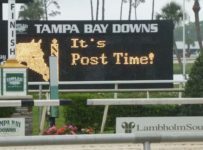 Scheduled post for the fourth race is 2:49 p.m. 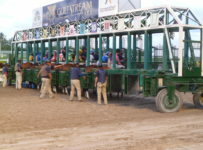 It is the start of the Rainbow 6 with a carryover that has grown to $185,955. The fourth race also will have a carryover of $15,529.80 on the Super Hi-5. That race has eight entrants, and is the day’s first race that could have seven or more starters and thus offer the Super Hi-5. Thursday’s first, second and third races all have just six entrants. There is the carryover because there were no winning Super Hi-5 tickets on each of Wednesday’s last two races with the bet. Bettors had the night and have into early this afternoon to handicap, and likely will add more than $50,000 to the Rainbow 6 pool. The bet is $1 minimum and requires having the first five finishers in correct order. 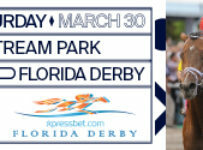 If there are no such tickets, the full pool rolls over until the next race with seven or more starters. There are no consolation payouts, such as four of five places. 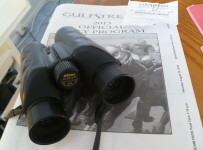 The fourth race is a $12,500 claimer at 7 ½ furlongs on turf for 3-year-olds and up. 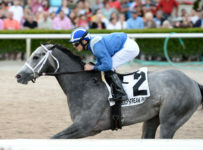 Hy Kodiak Warrior caught the leaders at the top of the stretch and went on to beat Chepstow by three lengths in Wednesday’s seventh and feature race at Gulfstream. Hy Kodiak Warrior chased a fast pace and won the one mile dirt race in 1:36.90 on the track listed as fast. 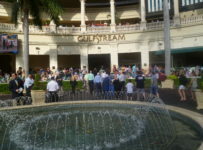 The race was a $25,000 optional claimer for 3-year-olds and up, with a $43,000 purse. It was the second win in 14 career starts for Hy Kodiak Warrior, who has raced mostly at higher levels than Wednesday’s race. He is a 5-year-old non-gelded son of Kodiak Kowboy. Leonel Reyes rode Hy Kodiak Warrior for trainer Antonio Sano. 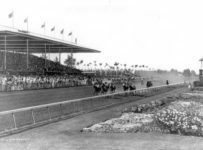 Hy Kodiak Warrior was the 2-1 second choice in the six-horse field. He was in fourth place after three-quarters of a mile. Chepstow, at 7-1, led at that call in 1:10.89. 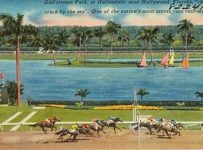 He was a half length in front of the 4-5 favorite Russian Greek, who faded and finished fifth.